Uptake is a predictive analytics solution that utilizes data science for its analytic processes while ensuring a company’s data security. The solution mitigates the risks and expenses of industries by identifying technologies that may be at risk of breaking down. This way, companies can get to work on resolving the matter immediately. 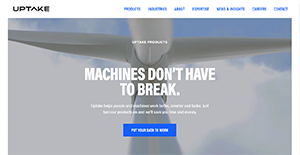 With Uptake, global industries also enjoy the power of the Internet of Things. The solution offers fast track assessments that help businesses and organizations discover new insights and opportunities and find ways to tap into them. This allows them to optimize the use of their data and technology and enjoy a great, positive impact. With Uptake, companies are able to mitigate losses of up to billions of dollars. The solution enables this by assessing company data and technology and pinpointing vulnerable and weak links and other liabilities. This protects companies against potential attackers since they are already aware of these points and are thus able to amplify their security. Uptake provides industries with the insights they need in order to perform consistently and to deliver productive results. By identifying risks, system downtime is decreased, and the potentials of critical assets are maximized. At the same time, asset lifecycle costs are reduced, letting companies enjoy boosted profitability. Uptake introduces tools and insights that enable teams to be agile and more productive when performing their tasks. The solution assists managers and executives assign the right people to monitor the right equipment and ensures that they have the correct information within reach all the time. On top of that, various task workflows such as asset maintenance and parts inventory become improved. With Uptake, industries enjoy the benefits of quality data. By having clean and accurate information, organizations can look forward to highly accurate predictions that help key persons in making intelligent decisions for maximum outcomes. If you are considering Uptake it might also be a good idea to examine other subcategories of Best Business Intelligence Software gathered in our database of B2B software reviews. Every enterprise has different requirements and needs a software that can be customized for their size, type of workers and clients, and the specific industry they are in. For these reasons, no platform can provide perfect functionality off-the-shelf. When you search a software app, first be sure what you need it for. Read some Uptake reviews and ask yourself do you want basic features or do you require sophisticated tools? Are there any industry-specific tools that you are seeking? Obtain the answers to these questions to aid your search. There are plenty of aspects that you need to consider and these include your budget, specific business wants, your organization size, integration needs etc. Take your time, check out a few free trials, and finally choose the platform that offers all that you need to enhance your firm efficiency and productivity. How Much Does Uptake Cost? We realize that when you make a decision to buy Business Intelligence Software it’s important not only to see how experts evaluate it in their reviews, but also to find out if the real people and companies that buy it are actually satisfied with the product. That’s why we’ve created our behavior-based Customer Satisfaction Algorithm™ that gathers customer reviews, comments and Uptake reviews across a wide range of social media sites. The data is then presented in an easy to digest form showing how many people had positive and negative experience with Uptake. With that information at hand you should be equipped to make an informed buying decision that you won’t regret. What are Uptake pricing details? What integrations are available for Uptake? If you need more information about Uptake or you simply have a question let us know what you need and we’ll forward your request directly to the vendor.